This is a lovely dish to make now that the cooler weather has started. I always have a packet of frozen prawns in my freezer, I love them. On days when I'm busy and can't get out to the shops, or when the kids are not well and you are stuck at home, I defrost the prawns and you can make loads of different recipes. I am very lucky to live 2 minutes walking distance from a brilliant fruit shop and supermarket/liquor shop. So I just dash out to buy the other ingredients I need and dinner gets started quickly. 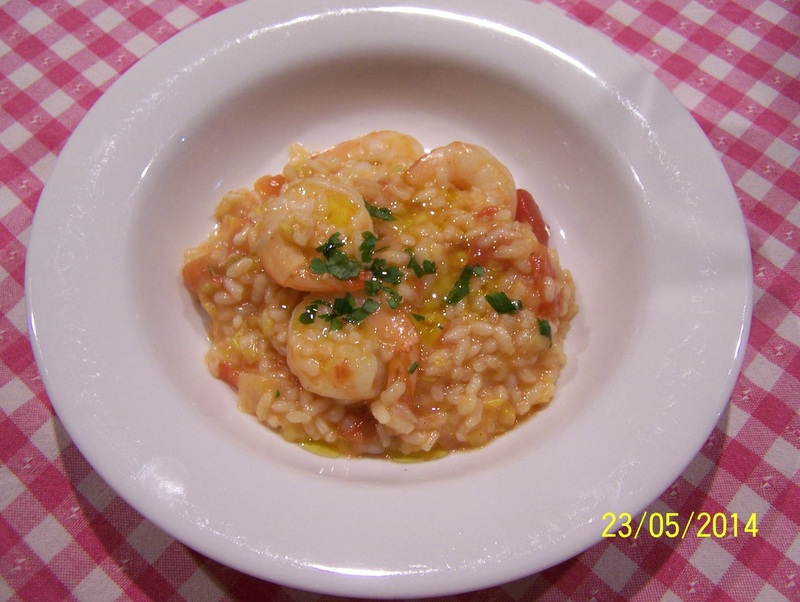 This is a great mid week meal, lovely flavours, simple to make. Fill a kettle with water and heat to boil. You need to peel away the skin of the tomato. Score a small cross into the top of the tomato. Place in a heatproof bowl that is just larger than the tomatoes. Fill the bowl with boiling water from the kettle to completely cover the tomato. Allow to sit for 30 seconds to a minute, then remove from heat and peel away the skin. It should come off easily. Chop up the tomato, set aside until needed. Combine stock and the tinned tomatoes in a medium saucepan, season with salt and pepper. Bring to the boil, turn off the heat, but keep hot. Heat the oil in a large pan, add the leeks and garlic, cook, stirring, until the leeks are soft. Add the rice, stir to coat with oil. Add the wine, simmer, uncovered, until the wine has been absorbed. Stir in 1/2-1 cup of the hot stock mixture, I like the liquid to cover the rice, simmer, stirring, until the liquid is absorbed. Continue adding stock mixture gradually, stirring continuously, until absorbed before next addition, until all the stock mixture is absorbed, this should take about 30 minutes, or until the rice is tender. Now if you feel the rice is not cooked after all the stock is used, this is where I add the water from the kettle. As for seasoning I like to add some vegeta for seasoning, so taste your rice, if you are happy with it leave it, if you think it needs some vegeta add a little until you get the flavour you are happy with. Stir in the chopped tomatoes and prawns. Cover, cook for about 3 minutes, or until the prawns are just tender. Stir in grated cheese. Garnish with extra shaved parmesan, shredded parsley and a drizzle of extra virgin olive oil.